Each year biking takes us beyond just school and back. More of us bike to work, the gym, and the corner market as a way to avoid traffic, save on gas, and save good old Mother Earth. But we still have stuff and need good ways to carry it. More commuting means we need to store devices, work papers, lunches, and spare clothing for work or the gym. We’re here to make things easy. Here is our list of the best cycling backpacks on the road today. 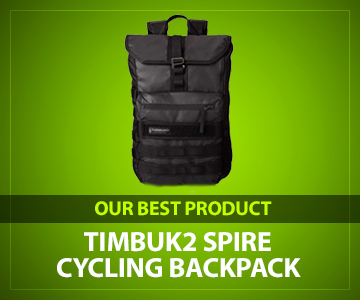 Timbuk2 offers a wide range of reliable backpacks, but this one works especially well for cycling. It is thin, lightweight, and fits snugly while you carry your devices and zig zag through traffic. This backpack is designed with your electronic devices in mind. It was designed specifically for Apple products though it works with any device of a similar size (15” Macbook size and most standard tablets). The picture of detailed dimensions on the link shows you exactly if your devices fit. This bag makes you look good. It has an attractive, black, slim design with an urban feel so you feel right at home in the city. It has a wide, fold-out top for easy access to materials and quick storage. Inside are separate slots for your laptop and tablet and enough room to store chargers and cords. 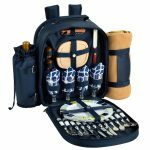 It also has a handy outer pocket for added storage and two water bottle holders that accommodate larger-than-standard bottles. The bag is padded throughout to protect your devices. Timbuk2 opted for water-resistant 630D Oxford nylon, making the bag durable and water resistant – an important feature when carrying devices. It works best in light to normal rain conditions. 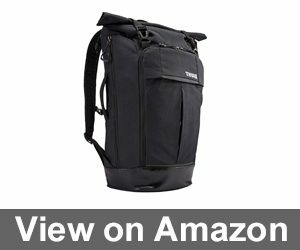 Timbuk2 warranties all their bag products, allowing for increased peace of mind and an enduring product. The back and straps are padded for comfort. The back is ventilated for increased breathability, cutting down the dreaded back sweat. The bottom, however, is not padded, so take care when setting the bag down with your devices. Also, overloading while biking can create an odd weight distribution. It performs best for streamlined carrying. 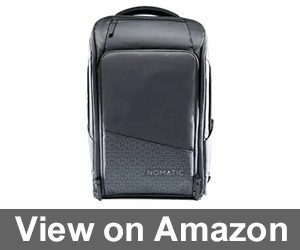 NOMATIC is another provider of reliable bags which interestingly started from Kickstarter. The success of the products has resulted in more bag designs each year. While our previous bag excelled in streamlined design, this one excels in expansiveness in storage. It also comes with special anti-theft capabilities; very helpful when carrying devices. The bag’s anti-theft characteristics lie in its lockable zippers and hidden RFID blocking. And since we’re discussing safety, it also prevents dangers by using reflective ink for nighttime biking. The backpack expands from 20 to 34 liters for maximum carrying ability, as well as compactness. It has a laptop pocket and a second large storage section for cords, phone, tablet or wallet. A special retractable key leash makes it easy to find and return your keys to your bag. The exterior has two water bottle pockets. If you don’t carry water, magnetic snaps keep the pockets closed for a clean design. The bag comes with a lifetime guarantee. It has a special side handle and the back straps tuck away so you can carry the bag like a briefcase. It uses water-resistant Kodra 500D Tarpaulin fabric and the exterior zippers are waterproof; however, reviews are negative on the overall waterproof ability. Some people remark about the weight. The bag itself is nearly 3 ½ lbs. It can also be a bit blocky for some people. That all said, the bag carries a lot. 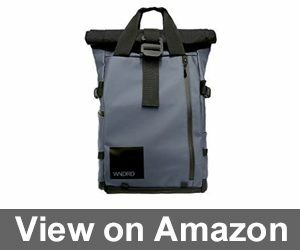 It isn’t truly waterproof even though it uses waterproof zippers, but it is a good bag for those needing more space, quality materials, and theft protection and who don’t have a huge concern about weather conditions or a sleek look. Strong outer material resists scratching. One recurring need for people with cycling bags is waterproofing. 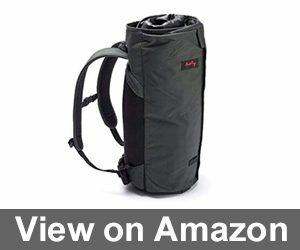 This bag is designed as a camera bag, giving you all the waterproofing you need. And like other camera bags, the camera dividers are removable, allowing for storage of most anything even if you don’t own a camera. This bag is lightweight at 2.8 lbs. It’s good looking and provides plenty of protection. Three different openings provide quick camera access… a useful feature for anything you carry. You can lay it flat and open, or adjust the top, or gain quick side access. The bag expands to create an additional 5 Liters of space when needed. External straps allow you to attach more gear if you like. Inside, your devices remain secure, fitting a 15” MacBook Pro laptop and separate tablet sleeve. And for rainy days, it has an attached rain tarp. Throughout all of this, the bag is good looking. There is also a nifty bonus feature: a special pocket sits on the inside back to secretly store your passport, wallet, or other valuables. 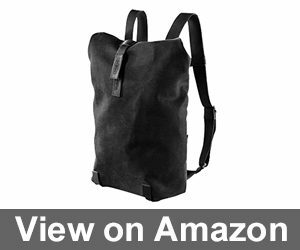 Its breathable back keeps you cool and its adjustable waist straps keep the bag snug. With its ability to shrink in size when needed and its added padding, you get the benefit of safe bike riding; however, you aren’t able to transport water bottles on the outside. And since you are carrying devices, it would be best not to carry water inside as well. So drink up before you ride. 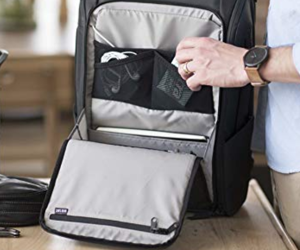 If you are commuting to and from work or the gym, this is the best way to store and transport your clothing while still carrying needed devices. This bag helps you transport clothing easily and wrinkle-free. The bag’s rolled design allows for hanging clothing while storing your laptop and tablet with adequate padding. You can fit shoes and a toiletry kit if needed. A water-resistant rain cover ensures clothing and other contents stay dry. And its unique internal design ensures your dirty clothing remains separate from the clean. It’s also carry-on sized, making it an easy and comfortable pack for other traveling. It’s definitely a unique design and very creative but excels in just these areas. Don’t expect to carry other books and binders with you. It’s also limiting if needing to carry other items that would typically be stored in separate pockets, like keys and sunglasses. That said, while other rollable clothing bags on the market may look more sophisticated, this backpack makes carrying clothing a breeze… especially on a bike. The bag doesn’t easily carry or organize other items besides clothing and electronics. It is difficult to access internal items without unrolling. If you like some sophistication in your cycling, this is the bag for you. Made of water-resistant canvas and Leather, you get deep, open storage while maintaining a stylish, minimalist look. 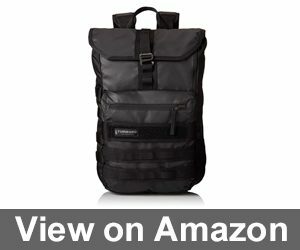 This cleanly designed backpack comes in black, blue, orange, and grey. The maker has been around quite a while (since 1866) making items like bags and saddles, so they know how to make a reliable product. This open satchel style unclips to offer wide access inside, holding up to 24 liters. Inside is an interior zipper compartment to hold a laptop and a few compartments to carry smaller items. With the clean look, you also get exterior storage. Two outer zippers sit behind your back, making the outer design ultra-clean and safer to store sensitive items like phones and a wallet. The canvas and leather are water resistant. The bag has the capability to hold big laptops, even 17.3”. This is a stylish bag, no doubt. And it is very well constructed with superb stitching. With the construction of canvas of leather, it is not as padded or breathable as other bags, but the design is safe if you need to hide expensive items. You won’t be able to store water on the outside. People do find it comfortable though. A convenient chest strap makes for easier bike riding. And the open compartment allows virtually no limit on laptop size. Do you need to stay organized? InCase, a quality producer of cases and bags, has the pockets and compartments to keep you organized in style. Packaged in an attractive design, this bag still offers a huge number of pockets: You have one for your 15” laptop that includes a special faux-fur lining, another larger compartment that can hold a second laptop, binder and books, and a third with multiple inner pockets for pens, keys, wallets, sunglasses or your phone. There are external side pockets, one large enough to hold an iPad and another to hold devices such as a battery and iPod with special cord access for earphones or charging cable. 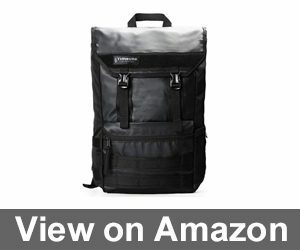 This bag is made of heavy-duty durable 840D ballistic nylon. 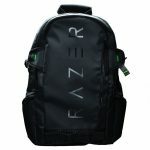 There are padded adjustable shoulder straps and special padding and air channeling on the back for additional comfort. You also have sternum straps for added stability while biking. There is an upper handle for easy lifting or storing. The bag comes in black, grey or red. InCase is a quality producer and you’ll have a bag that will work for years to come. And it excels in keeping you organized in style and comfort. 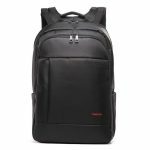 With the benefits, though, there are some drawbacks: with all the zippers and separate compartments, you are limited in how much you can carry, and accessing what you carry is more difficult. There is also no water bottle storage. Some remark the zippers aren’t covered for repairs, but overall the durability is good for the long haul – literally. Lots of pockets, but nowhere to put your water bottle. This bag is specially made for biking enthusiasts who need to stay organized. Thule is a good product of bags and with this bag, they really thought things over. You have lots of flexibility in storage. A large compartment has a special rolled top for wide access and secure storage of a 15” laptop and 10.1” tablet while still allowing space for additional books, food, or clothing. A second large compartment provides a wealth of pockets to store anything from cables to your wallet and phone. There are also two zipper compartments inside for more safe storage. A special strap is provided to hold your keys. And it doesn’t stop there: an additional outside pocket allows for smaller storage of quick access items such as your sunglasses, and another expandable adjustable flap can hold your helmet. (Very handy!) And a water bottle fits nicely inside a side packet. It has a specially sewn bottom for stronger protection on the ground, and it will stand upright for easy access. For easy bike riding, you have a chest clip. And the special tapered design makes it easier to stay balanced while riding your bike and at the same time making it good looking. 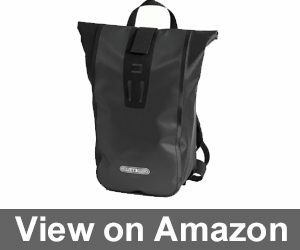 This bag excels in providing lots of separate storage while still allowing for adequate, easy-to-access storage of your helmet. It even has a place for a bike light. And it is specially balanced for bike riding. If you plan on doing a lot of riding, this is a versatile option. Tapered design for easy biking. Not designed for newer 15” MacBook Pros. It’s best for thin laptops. If you love “less is more”, this ultra-clean design works well for the minimalists at heart… without sacrificing storage. This bag is a great combination of strength and clean design. It is available in three colors: white, black and yellow. The clean look means there are no external pockets, but it does have external loops if you need to include more. Its rolled top allows for wide access to all your things while still including a laptop compartment. It carries up to 24 liters. It is very comfortable, using anatomically-shaped shoulder straps. And it is waterproof. With its waterproof feature, you rest at ease that what you carry stays dry. Some remark that the Velcro enclosure is not very strong, which would be an issue if you overpack the backpack. It is also shaped in such a way that the top is wide when closed, making it hard to see behind you at times while biking, though reviews on this issue are mixed. Oakley is known for its outdoor products, and Voyage 25 is an especially good option for biking. It’s made to fit snug, breathe well against your back, and reflect at night to protect you from danger, all while thoroughly padding your items. This bag comes in blue, red, black, grey, and a green color called Night Olive. The design blends together convenient storage with padded comfort without sacrificing its lightweight. A specially padded ventilated back keeps you cool while padded arms provide additional comfort. And special side straps compress the bag tighter for riding. The inside of the bag is large, holding up to 32 liters. The top has a large padded pocket for sunglasses. Inside, the main pocket is deep, allowing you to carry freely what you need while providing padded sleeves for your tablet and laptop. It fits a 17” Mac Pro. There are also additional interior pockets for items like your wallet, pens, and phone, and a strap to hold your keychain. Other benefits include a top-grab handle, reflective strips, exterior lashing points for more carrying ability, side pockets for water, and a special water-resistant coating. This bag provides good padding for you and your devices while staying lightweight and water resistant. There are other sizes available on the market, both larger and smaller (the 25 and 27L), so you can get the right fit you need. And it’s ready to be used in the outdoors, even supplying a hole for a hydration pack. The colors can be quite bright, but thankfully they do offer milder, darker colors. We are back with another clean and attractive design by Timbuk2. Like the previous, you have the flexibility of easy storage and a clean, urban look, and this one does it at a much lower price… if you love black. The bag comes in black and is produced in polyvinyl. It has a large compartment with a top that is secured with two clamps. Inside there is a sleeve that fits a large laptop as big as 17”. There is also a small zipper pocket and a few slots for pens. On the outside, it contains one exterior zip pocket on the back and two wide side pockets to carry water. There are additional straps on the lower back to attach anything else you may need. 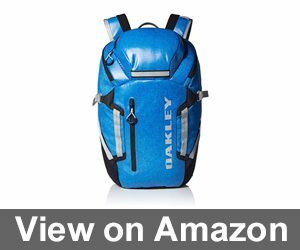 People enjoy the comfort of this backpack with it also being compact enough to fit in tight areas such as under an airplane seat. A padded back and straps make it more comfortable to use on your bike. And the price is hard to beat. One thing to keep in mind, however, is the laptop pocket is not padded. If you live in heavy rain, a waterproof bag is what you want. Most on this list are water resistant and will give you good protection from the weather, but in strong weather conditions, backpacks like the Oakley and Ortlieb make the difference. Bags are mostly categorized in Liters ranging from 24 to 32 Liters. For reference, a standard school backpack starts at around 24 Liters. Since bags vary in storage capabilities and comfort, understanding what works best for your exact situation makes choosing easy. Do you carry a laptop and a tablet? Do you need to easily store a bike helmet? The right backpack will make for an ideal experience. Some providers offer warranties on their products. If they do, they are worth owning. Warranties indicate the quality in the bag and the companies work harder to prevent production issues before they start. Be sure to understand the laptop sleeve capabilities. Padding definitely makes life better but sleeves don’t always keep devices protected, especially on the bottom of the bag. You may need to include a padded laptop case.